Ruining teeth with Halloween treats? Luckily Junior liked it. Paired with ripped jeans, paint spattered hoodie, and fake bloodied face, he’ll be sorted. At 12 years, this will probably be his last time dressing up to go with the gang around the housing estate. Cool young dudes, they might not even bother with Trick or Treat. Part of me will miss it – the excitement on Halloween evening of cobbling together witch, vampire or grim reaper costumes. Applying ghostly white or glob green facepaint streaked with dripping faux blood, should the costume require it; or walking behind them with the flashlight in chaperone mode when they were really small. But one thing I won’t miss is the myriad of sweets the kids bring home after a lucrative number of house calls. Then looking at these bags of candied gunk that survive for weeks, some slipping down the side of the bed or getting stuck in the carpet. Are we driving our kids’ nuts with this Samhain Treat sugar fest? Tipping them towards diabetes, obesity or other sugar related health problems? Then there’s the teeth. The fourteen year-old got a lecture on his last visit to the dentist. “There are cavities forming above your braces,” she scolded, “And it’s due to too much sugar. Eat fruit and healthy food instead! These braces are costing your mum a lot.” Too right. He got another big lecture from me afterwards. At least he’s too old now for Trick or Treat. Maybe the old Halloween games like bobbing an apple in a bowl of water are best? Our parents didn’t have to worry about us being ‘wired to the moon’ or getting sick. Yet I don’t begrudge the kids their wild night of dress-up and overload of sugared junk. It’s brilliant fun and only happens once a year. I remembered spending one Halloween with my pal in Canada where a neighbouring dentist gave her daughter a toothbrush instead of sweets – what a killjoy! And yet I admired his over-zealous sense. 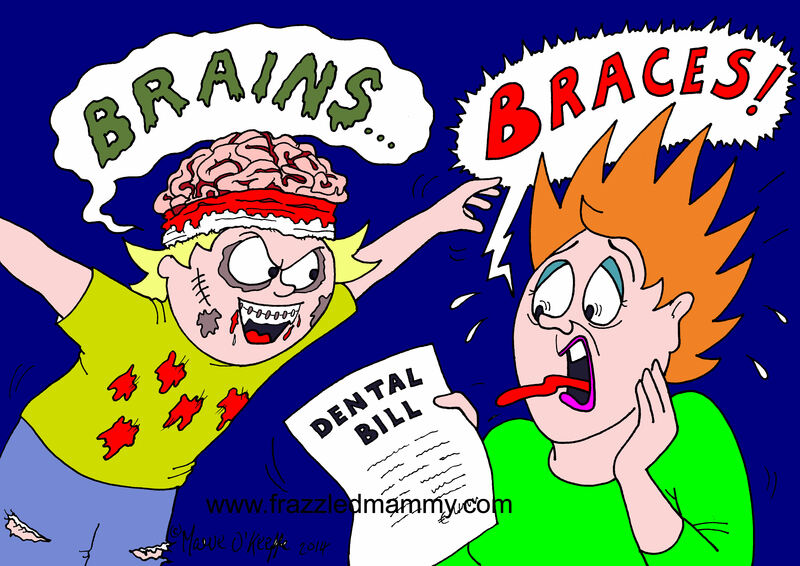 I’m still reeling from the nightmarish costs of dental care. 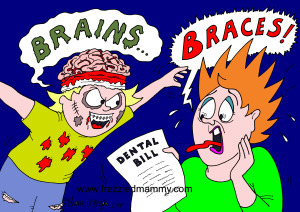 Never mind bleeding gums and Dracula fangs – the price of having two teenagers with braces and one who can’t be bothered to brush is enough to horrify any parent and turn us into grouching zombies! This entry was posted in Parenthood and tagged Cartoonist Cork, Cartoonist Ireland, Illustrator, Maeve O'Keeffe on October 29, 2014 by frazzledmammy.